Hi everyone. Well the weekend as been accident prone for both myself and my hubby! Saturday hubby fell backwards in the garden and just missed banging his head on the brick wall at the back. Got away with a grazed elbow. It could have been a lot lot worse than that and he was on his own. I went flying on Sunday morning flat out and landed heavily on my left side (hubby says), my knees felt like they'd taken the brunt of the fall. My left one came up with a lump n next time I looked it had a massive lump. It felt like a bursa on top of the original lump. Lol anyhow can feel left hip as well as knee going up and downstairs. No bruising yet which is unusual for me I bruise dead easily, lol. Right back to the card I've done it for my number 2 brothers 65th birthday which is on Friday. Hope you like! 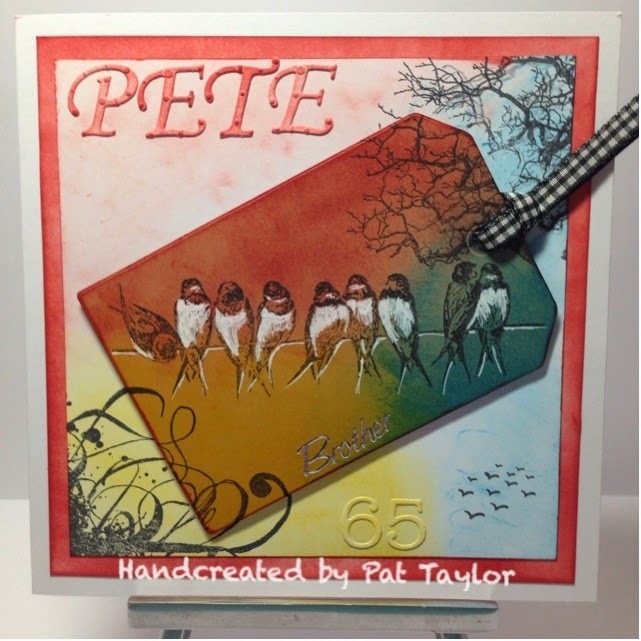 This is fabulous Pat, love the design and the tag looks stunning. Fabulous design, colour and detail. Hope the rest of the week is accident free. Love this card - fabulous! My first attempt at crafting was knitting a dishcloth done at junior school. My mum used to sew knit and crochet so I learnt to sew and knit properly from her. I never tried to crochet though. As a teenager I would knit and sew some of my own clothes and then at about the age of 17/18 I would spend Saturdays beavering away on the old treadle sewing machine. that night i would be wearing my new dress to go out! Once married and the children came along I would knit and sew for them. I didnt find cardmaking until January 2010 after a distant relative (GRU)had sent a handmade xmas card and I thought maybe I could do that.So off to the shops looking for what we know as stash and I found numerous magazines on the subject.Hooked from the very first card I did!Then in 2012 a FB friend suggested watching Creat and Craft and the Popular Barbara Gray with her Clarity Stamps. Subscription for Clarity was bought me for my birthday and I was into stamping! I used to think it would be cheaper to make my own greeting cards but no way, its an expensive hobby and one I love.